Welcome to 2019! Not quite the future that was promised to us in Blade Runner, Back to The Future, or my unpublished sequel to Cool Runnings I wrote 22 years ago that takes place in 2019, but at least we are still here, together, crying in unison and looking online for things that make us scream and smile simultaneously. So why not make your torso scream and smile simultaneously, too? 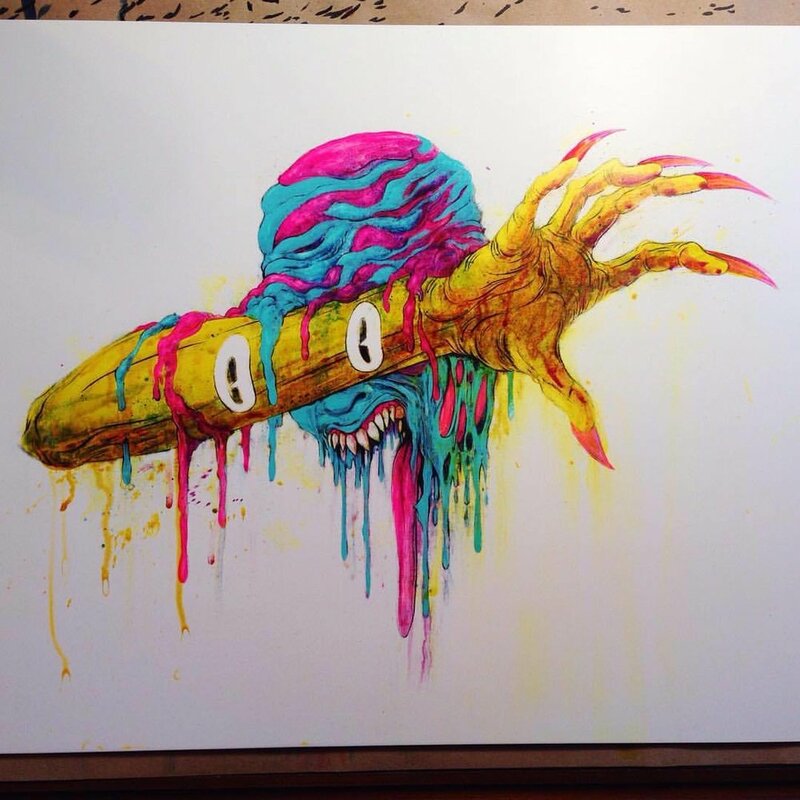 "SHUNDERLAND" will be going up for Pre-Order at 4PM PST on Thursday, January 10thexclusively on my site at alexpardee.com for $30 each. You can pre-order it at any time between January 10th and January 17th to guarantee your size. After January 17th there is no guarantee that your size will be available. Plus, the FIRST 75 PRE-ORDERS will get a FREE "SHUNDERLAND" Enamel Pin to go along with the shirt. As usual, the pin will be automatically included with your order while supplies last. The best way to know if you will receive a free pin is simple. If the "FREE PIN" banner is still visible on the store at the time you pre-order, you will get it. Also, "SHUNDERLAND" shirts and prints will ship at the end of January. SEE YOU HERE JANUARY 10th! For years I have used my free time to absorb any and all pop culture, mix it up in my brain, and spit it back out on paper in a big pile of artsy mashed potatoes that simulatanously disgrace what I love AND make me laugh. Occasionally, I have offered some of these bad jokes in tangible form as prints and shirts, but STARTING TONIGHT, June 5th at 9PM PST, these "Pop CultJerks" are finally starting to become available in one single place, and you can help your torso feel good while making yourself laugh while offending strangers. Sound good? GOOD! Then have fun!!! Check out the ENTIRE COLLECTION below, and pick them up in the SHOP TONIGHT!! 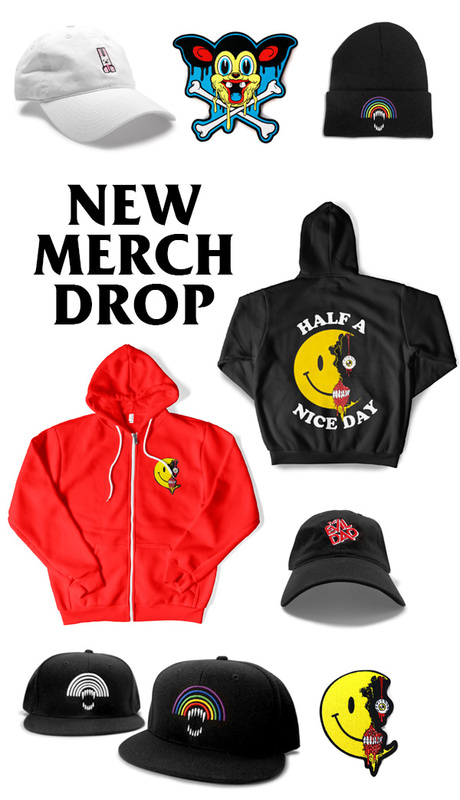 Some are available to purchase for the FIRST TIME EVER! Get them HERE, starting at 9PM tonight, June 5th. They're back! After the original "PinPrints" sold out so quickly last year, you would think I would have made some more right away, but after absorbing your feedback, I actually needed some time to make the product better, and ultimately BIGGER! So here are the new and improved "PinPrints". They are fine art prints....FOR YOUR PINS! Now they are bigger, measuring at a huge 18" x 27", these screen-printed canvases can hold a TON of enamel pins (or anything else you want to stab in them). These 4 PinPrints are NOW AVAILABLE to buy for ONLY 72 HOURS! They will disappear after Weds, May 23, so don't miss out! Your pins will be stoked. Each print is $40 each, OR you can get ALL 4 PRINTS for only $120, which is a $40 savings! Get them all HERE NOW! Not too many people still have printers, but if you do, feel free to download these images to use for some fun holiday cards. You can also use them for electronic cards, if you live in the future! Happy Holidays!